Sarah Palin and LL Cool J at odds over his "appearance" on Sarah Palin's new show. I find the Sarah Palin, LL Cool J "controversy" a dead heat. Although I think it is wrong of Fox Television to imply that someone is appearing on Sarah Palin's television show now because they did an interview for Fox two years earlier, I also think that the Fox promo that was generated for Sarah Palin's show is solid work. The Promo doesn't try and mislead one into thinking that Sarah Palin actually interviewed LL Cool J. Hasn't Katie Couric been featured in a past promotion in a similar way to how Sarah Palin is being featured in the Fox Promo of her television show? It would have been interesting if Fox had first sent a promo out to all the people appearing in the promo to see if they approved. If advance notice had been given, I wonder if LL Cool J would have been so uppity about being included. The Hypocrisy, Stupidity, and Inconsistency of Michael Moore during the 2008 democratic presidential nominee race. Something happened in 2008 that is still being covered up, and covered up big time. I believe it involves Hollywood and the promise of distribution deals to anyone who publicly backed Barack Obama over Hillary Clinton. As exhibit A, I would like to point out the utterly bizarre behavior of Michael Moore during the 2008 presidential election. You would think a man who built his early career success by portraying his own state as dying and destitute because the unions had been crushed by Roger Smith of General Motors, would fight for his state's right to move their democratic primary date up. You would further think that since Illinois DID MOVE UP their 2008 primary date by SEVEN WEEKS to help Barack Obama, Moore would be complaining about Illinois getting preferential treatment while his own beloved state of Michigan was being disqualified from the voting process! When one factors in that Michigan moved their primary date up out of economic desperation, how could Michael Moore not fight for his own state? Sequestering the vote tallies from Florida and Michigan until the beginning of February as a form of "punishment" was the logical solution. However, that would have made Barack Obama look foolish for taking his name off of the ballot in Michigan, and we couldn't have that now, could we? Instead, Obama and two other democratic presidential candidates purposely waited until the last day to legally withdraw their names from Michigan so they could then criticize Hillary Clinton for staying on the Michigan ballot. While some can claim that a brilliant political ploy, if Hillary Clinton had taken her name off of the Michigan ballot first, Obama would have stayed on and cajoled and ridiculed Hillary Clinton for thinking it was all about her, and that she was so confident of victory that she didn't care about Michigan or its people. In 2008, it was ok to portray Hillary Clinton as making a foolish political gambit, but never Barack Obama. When Michael Moore put that one short video clip of Hillary Clinton interacting with Republicans in his documentary as a way of blaming her for Health care not being passed in 1992, I began to wonder what Moore's real agenda was. Healthcare not passing during Bill Clinton's first term had NOTHING TO DO WITH HILLARY CLINTON, and everything to do with how upset republicans were over losing to Bill Clinton after George Bush had had a 91% approval rating in early 1991. For Moore to skip over that reality is very disconcerting. A documentary film maker who first profits over his own states demise, but then won't fight for his own state regarding the 2008 democratic primary makes me wonder just what other evil lurks in Michael Moore's pysche. Was the Hillary Clinton clip purposely put into Moore's documentary to help set her up as being "polarizing"? Did Moore get any distribution deals for going against his own state and Hillary Clinton? Speaking of deals, did you know that the VERY FIRST COMMERCIAL that MSNBC ran after Hillary Clinton's suspension speech WAS A COMMERCIAL FOR THE STATE OF MICHIGAN. If Hollywood wants to support one political side versus another, that is their right, but when Hollywood actually sabotages one democratic candidates chances to win the party nomination without full disclosure, in my opinion they have a crossed a line of ethics I cannot accept. LOUISA RODAS March 27, 2010 UPDATE! Great News from Betty Jean Kling about Louisa Rodas, click here to learn more. 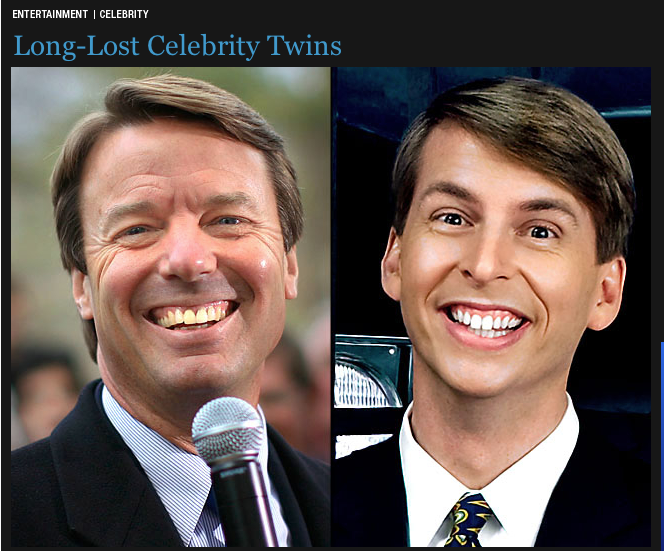 CELEBRITY TWIN LOOK ALIKES. Or, face recognition technology gone wild. Click here to see the slide show. Random Thoughts on Health Care Reform. Taxing income earners who are making over 200,000 or 250,000 is going to generate enough money to give everybody in the United States health care, really? It seems too good to be true, unless you make over 200,000 or 250,000. Listener comments heard on KFI-640 AM radio on Monday, March 22, 2010 on the John and Ken Show. "Are those who will be paying more into the healthcare system so others can benefit allowed to get in the face of someone who is overweight and glucking down a bunch of Big Macs, pies, or both? John and Ken chimed in with "Will Health care simply be "rationed"? You get whatever you want, but you may have to wait months for the procedure". If the same number of services or procedures are offered as before, but now there are another 35 million people eligible for the services, that could lead to dilution of health care services, or, what can also be called rationing. Will the I.R.S. have more power to see what we spend or don't spend on universal health care? Is it true that buying catastrophic health care only will not be considered adequate health care coverage? I wonder if universal health care will motivate more illegal immigration since I presume both legal and illegal residents will have access. It appears Barack Obama has promised support of universal amnesty to get support from some congress people. Beneath the surface, most of Barack Obama's "do gooding" appears to leave the elderly behind. As I became involved in my mother's and father's healthcare I realized that it can become a self defeating prophecy to try and do what is required without assistance from another family member. The elderly will probably just give up on certain treatments if the timeline to get the treatment is increased because of health care rationing. In my opinion, unless a cap is put on the amount of time one has to wait for treatment, any attempt at health care reform will be tainted since it will mean that those now paying more into the system may actually get worse health care than they had before. The Selfishness of Nancy Pelosi and Harry Reid and Healthcare Reform. If healthcare reform was so important to Nancy Pelosi and Harry Reid, why didn't they back Hillary Clinton in 2008? When Bill Clinton wanted Hillary Clinton involved in Health Care discussions with the republicans back in 1992, the talks failed not because of Hillary Clinton, but because of how Bill Clinton won the presidency. Don't be fooled by Michael Moore's insipid video in which he shows a short clip of an exchange between Hillary Clinton and the Republicans back in 1992 as if to imply that Hillary Clinton ruined health care reform back then. That was typical Michael Moore serving up a hackneyed innuendo that is nonsensical. 1992 was an abomination for the republicans. George Bush had a 91% approval rating right after the desert storm war of 1990-1991. The 1991 republicans were so giddily looking forward to the 1992 presidential elections and another four years of George Bush that they could not contain their premature celebratory glee. Rush Limbaugh laughingly called the seven 1992 presidential democratic candidates the "seven dwarves". Rush Limbaugh ridiculed the individual democratic candidates as well, calling Paul Tsongas "Paul Tax On Gas". Republicans were also looking forward to a bigger 1992 presidential victory margin than Ronald Reagan had achieved against Jimmy Carter and then Walter Mondale in the 80's. Then Bill Clinton happened, and the republicans disgust at losing to a hic from Arkansas was apoplectic. From George Bush and on down the line, the embarrassment the republicans felt was boundless. All of these early 90's events conspired to doom healthcare in 1992. The idea that it was Hillary Clinton's persona that killed health care in 1992 was preposterous. The 1992 republicans were not humbled, they were ANGRY. Sister Theresa could not have passed health care in 1992. The Michael Moore Hillary Clinton slam is just another of the typically stupid Michael Moore documentary claims that are starting to pile so high I am beginning to wonder why I ever liked the guy. As for Nancy Pelosi, how come 16 years later is Pelosi so bent on NOT SUPPORTING Hillary Clinton in the 2008 democratic nomination? Are Nancy Pelosi and Harry Reid so devoid of common sense they can't even understand what actually happened in 1992? Would it have been so awful to have Hillary Clinton, 16 years later, charm the pants off of the republican party and actually include them in the health care reform talks to the point where neither democrats or republicans could take full credit for health care reform and instead would admit to the reform being bi-partisan? Would it really have been so bad to give Hillary Clinton her first real shot at passing health care in 2009? Nancy Pelosi and Harry Reid have got to lose their re-election bids, please, for the sake of the democratic party, please let it be so. "I've got a lot of issues going on right now," Smith said. "I've got a plane that's all torn up. And I've got a young man that I killed." Did this pilot really mention the damage to his plane before the death that his plane caused? Click Here to read commentary. Labels: Gliding Plane kills jogger, jogging on the beach. Barack Obama, Lisa Madigan, LifeLock, and Rush Limbaugh, do the dots connect? LifeLock was recently fined millions of dollars for misleading statements. Illinois Attorney General Lisa Madigan appears to have been one of the leading attorneys general in the investigation. Lisa Madigan recently visited the White House as well. The company, LifeLock, which was heavily fined, advertises on the Rush Limbaugh show. What confused me about this situation is LifeLock apparently offers a huge reward if they fail to protect your identity from identity theft. Has LifeLock reneged on this offer because I read no mention of LifeLock not backing up their own guarantee when the fines were announced. What also is disconcerting is there are other identity theft companies bigger than Life Lock that apparently promise a free credit report, yet there are allegations that the report is not free even though they run television ads claiming it is a free credit report. So, was LifeLock singled out? Was LifeLock singled out because they advertised on the Rush Limbaugh show? I keep seeing a trend where the biggest, too big to fail companies get all of Barack Obama's love, and the rest of us get "trickle downed", or, nowadays, tinkled down. I am open to hearing other viewpoints, but please address why it's ok to go after a middling company while leaving the bigger ones alone, that is what I find truly disturbing. If this was retribution against Rush Limbaugh, then it just further proves how disgusting Chicago politics really is. I did find this rebuke of LifeLock and it makes a pretty strong case against LifeLock. You all do know that Illinois moved its 2008 primary date up to by seven weeks so as to impact the democratic primary race in Barack Obama's favor, yet punished Michigan for doing the same thing. You all realize that if Illinois had kept it's date where it was, Hillary Clinton would have had the lead in early February, not Barack Obama, and that would have made all the difference going into the caucus contests. The democrat party needs a really really big soul enema in the next elections, and Pelosi and Reid need to be discarded. If you are not comfortable voting Republican, DON'T BE AFRAID TO VOTE THIRD PARTY. I don't care about your farm, your fish, your park or your mafia facebook group has over 5 million members. I laughed when I saw this group on facebook called "I don't care about your farm, your fish, your park, or your mafia. To quote Chris Rock, "I don't exactly agree, but I undastand." California Politicians CRUSH the No Cussing Club when they should be EMBRACING It. Click here to go to the No Cussing Club. Budget deficit Article link here. Image from Gun Toting Liberal. Please link responsibly and give credit to Gun Toting Liberal if you use the image directly above. If the No Cussing week resolution cannot be passed because California has a budget deficit to deal with, why not pass a "No Cussing until the Budget is passed" resolution instead? Instead of the condescending tone that many "adults" and politicians are taking towards the no cussing resolution, why not strengthen the no cussing resolution instead? How about the "Politicians pay a 25 dollar fine (plus a 10 dollar fee for the follow up cuss that is sure to follow for cussing in the first place) every time they cuss before they approve a budget," resolution. Fining politicians every time they cuss while negotiating a new budget could end bringing in enough additional revenue to actually help solve the budget impasse. The idea that the No Cussing resolution is just fluff is the type of condescending tone that bullies use. 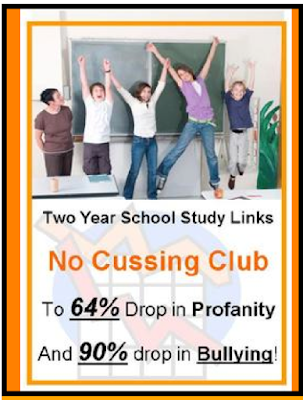 Did you know that high school bullying drops 90% when kids cuss less? Is it possible that the guy who regularly cusses in high school might be more likely to engage in domestic abuse later on? I don't know if such a study has been done, however, I believe that someone who cusses all the time would more likely to be a domestic abuser later on in life. So if politicians don't take the No Cussing bill seriously, are they closet serial domestic abusers? Is the no Cussing Resolution being stalled by Politicians who like to spank women? Labels: No Cussing Resolution stalled by Politicians who spank women. No Cussing Club California resolution to not cuss is being held up by California Legislators. I belong to the No Cussing Club. I have definitely curtailed my internet cussing. I don't think I did that much to begin with but I definitely have rewritten articles and removed cussing. I recall cussing one recently in an article, primarily to illustrate how important that one issue was to me. If I were to cuss about more things, it would diminish the point of cussing. I believe that Social cussing tends to create what I call "stupid bonding". I believe stupid bonding tends to lead to increased levels of violence, rancor, and all around pointless pontifications and interactions. Yes, cussing can be a release. But group cussing probably serves no useful purpose other than to ramp the group up for some kind of behavior that may endanger those outside of the group. Here is the email I received from McKay Hatch. I wanted to give you an update on ACR#112 Cuss Free Week. I want tothank all members for your help. It still hasn't gone through. Butwere not giving up just yet. We have to give it one last shot. Thisweek there passing other ACR's with no problem. But our ACR CussFree Week anti- bullying campaign was not even put up for a vote.It was supposed to be voted on today March 11th. So this is what weneed to do. There are five Senators stopping it on the rules committee. The main Senator is Senator Aanestad. He is the ViceChair of the rules committee. Please contact Senator Aanestad at(916) 651-4004 or email at senator.aanestad@sen.ca.gov and ask him to please allow ACR#112 Cuss Free Week up for a vote. Again I want to thank everyone that has called thus far. Pleasecontact him this is our last chance to make it work.I couldn't do it with out your support! McKay HatchFounder of the No Cussing Club P.S. I will keep you posted. Pee Poople dot com, because 2.6 billion people have no toilets but still have to go. I heard about this on KFI-640 AM Bill Handel show this morning. 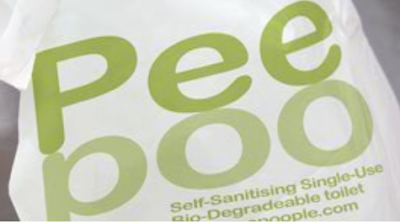 It's the Pee Poople bag, and when it is used to pee or poo into, the pee poople bag can literally be tossed, buried or flung into a ditch and apparently the pee poople bag breaks down the pee or the poo inside so it doesn't contaminate drinking water and instead turns the excretion into fertilizer. Wow, what an invention. Click here to learn more. When you get there click on the arrow. Not only can you learn more, but to also remind ourselves how lucky we are in the United States to have a sewage system in place that 2.6 billion people in the world would marvel at. How Men Get Ahead, How Women get Left Behind, How Barack Obama "won" the 2008 democratic nomination, courtesy of King of Queens. When I saw the above scene from the King of Queens, Season 6, Episode 7, Affidavit Justice, it just explains so well how men get ahead, how women get left behind, and how Barack Obama won. Just click here to see the scene. You only need to watch the first 80 seconds of this youtube clip, the kitchen table scene until Doug leaves the room, to have it all explained. Carrie (Hillary Clinton) is shocked that Doug can so easily get a position he hasn't earned. Arthur, (Harry Reid), berates Carrie for keeping "the man down". Even after Doug leaves the room, the discussion turns to a misspelling on a family tree search. Gasp. Girls on Water, Three Young woman crossing the oceans solo at the same time. So that makes three young women crossing the worlds oceans all on their own and at the same time. Jessica Watson's blog can be found here. Abbey Sunderland's blog can be found here. Then there is a third young woman who is ROWING across the Atlantic named Katie Spotz and her blog can be found here. All three of these blogs are presently on Daily PUMA. Sarah Palin attacked by Hollywood, just the way Hillary Clinton was attacked in the past. Here is an example of how Barack Obama Obots attack female politicians ch as Sarah Palin. First read the article, than read the contradicting comments section demanding the article be removed or "corrected" that were made by the actual company that hosted the event. Sarah Palin should sue the idiots for writing what they did. An open letter from Michael Moore, pointless pontificating puffery. Michael Moore was a big part of why Hillary Clinton lost Michigan in 2008. To make matters worse, Mr Puffers then put his foot in his mouth and verbally attacked Hillary Clinton because she voted for George Bush's war while Barack Obama merely voted present. How can I ever trust Michael Moore when he supported an unvetted candidate who is stealthily supported by the banks, BIG TIME! The best thing Michael Moore can do is start the healing within the democratic party by apologizing to Hillary Clinton. I won't print the vapid and insane email that Michael Moore sent out to his readers out of respect to everybody's time. ANYTHING is more valuable than reading the email that Michael Moore sent out. Are Hillary Clinton 2008 political supporters Walking off the Barack Obama Plank faster than the Barack Obama supporters? There is an interesting map that shows all of the democrats that are not running for re-election in 2010. Anybody want to take a shot at an article that breaks down how many democrats that are jumping ship supported Barack Obama versus Hillary Clinton in 2008? Click here to go to the map. I have no idea if there is any correlation or not, but it would be interesting to know one way or the other. DEMOCRAT HIT JOB AGAINST HILLARY CLINTON, AN ARTICLE BY CANNONFIRE WE SHOULD NEVER FORGET UNTIL RECTIFIED. I thought Mr. Cannon had changed his mind about his blog when I found this powerful article of his about the explosive amount of hate that was spewed at Hillary Clinton by the Obots. But then I saw the date of the article was from July 22 of 2008. Is Joe really going to take his site down so we lose the historical significance of what has been? Christian Science Monitor editorial hit job on Credit Card Reform Bill by Polina Vlasenko. I just lost a ton of respect for the Christian Science Monitor after their editorial hit job on the credit card reform bill appeared on Yahoo. The reverse argument would have been more truthful. Credit card companies rely on indenturing the poor so the poor can never pay off their debt, incur late fees and penalties, and pay higher interest rates that subsidize the free services and lower interest rates that the "good customers" get from the credit card companies. I question who Polina Vlasenko is and what her credentials are for writing such a hit piece.